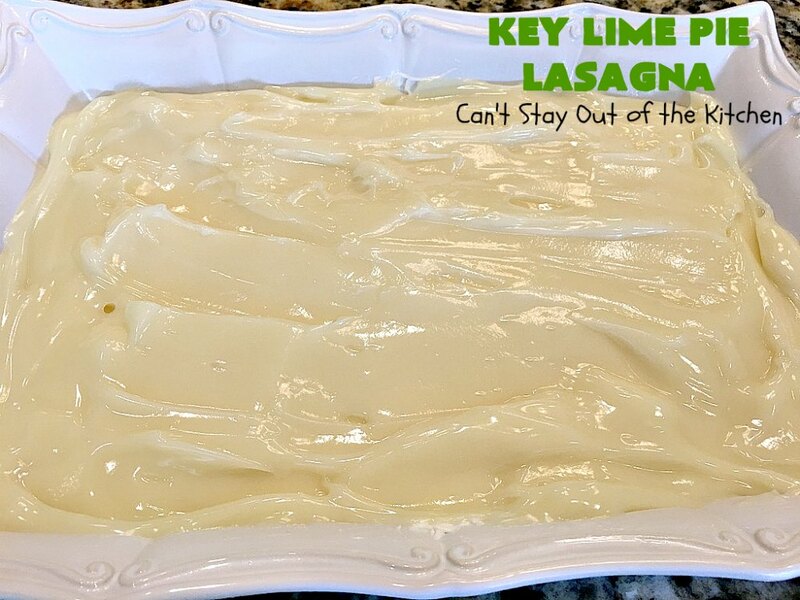 Key Lime Pie Lasagna is absolutely the B-E-S-T!!! 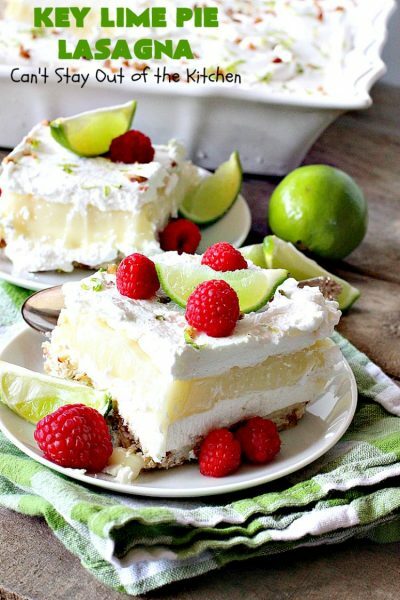 This dessert is fluffy and creamy, with just a little tartness from the Key Lime Pie filling. This four-layer dessert has a nutty crust layer. It’s topped with a cheesecake layer. 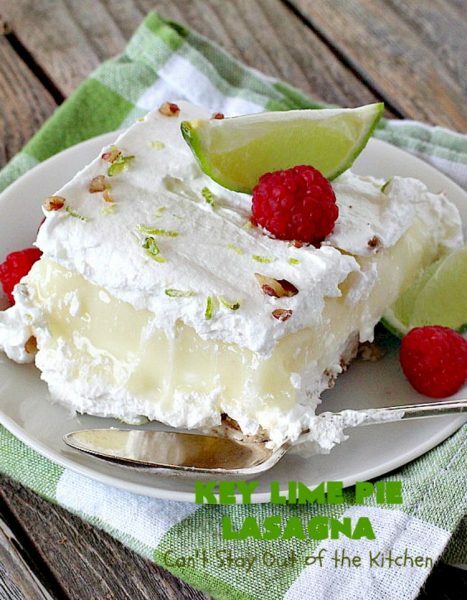 That’s followed by a Key Lime Pie filling layer. 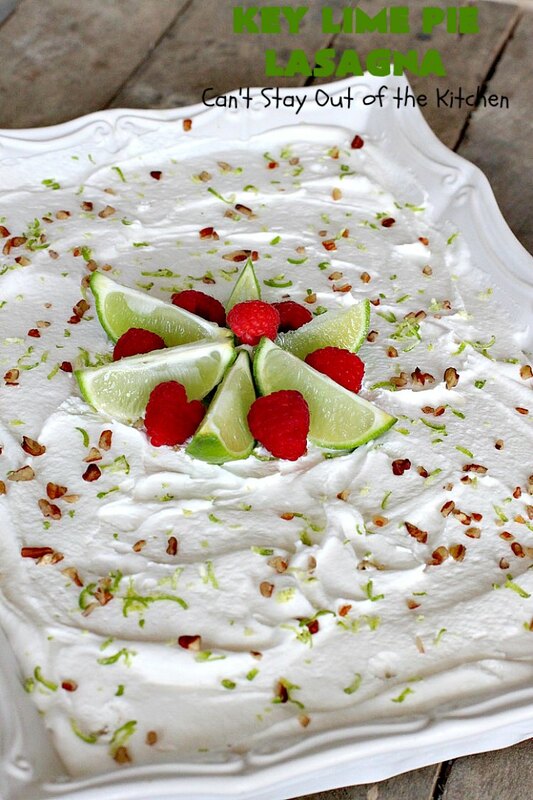 Finally, it’s topped off with whipped topping, more nuts and a little lime zest. Terrific, spectacular, extraordinary are only a few adjectives that can describe this fantastic dessert. Back last fall, I saw that our grocery stores were stocking Lucky Leaf Key Lime Pie filling. 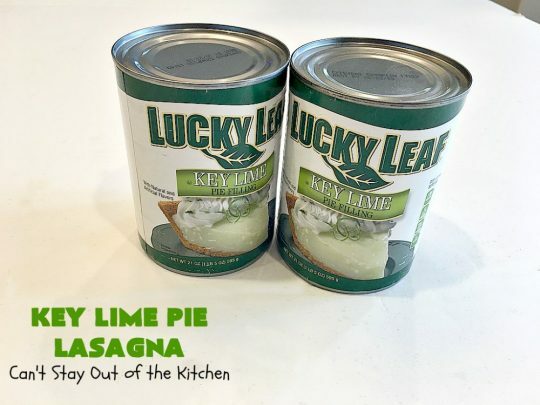 As soon as I saw it, I snatched several cans off the shelf knowing that I was going to try some new recipe with them. I wavered back and forth on what to make, but finally came up with this layered dessert. Based on my Mississippi Mud Pie dessert, this Key Lime Pie Lasagna rocks! I served it to our Friday night church care group. We meet weekly and there’s always fabulous food to be had! I got so many ooohs and ahhhs over this dessert. Everyone, without exception, loved it. 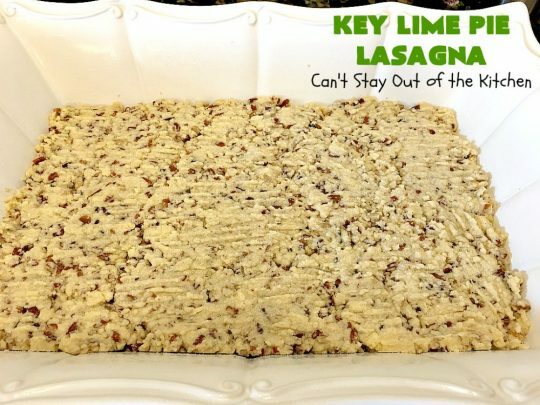 Yes, I hit the Grand Slam with this recipe. It had just the right amount of sweetness balanced with a little tartness. It had just the right amount of crunchiness from the crust to balance all the creamy layers. Of course, it didn’t hurt to have that cheesecake layer in the middle, either. If you want a dessert that will wow your family and friends for Mother’s Day or Father’s Day, this is the dessert that will do it. It’s really not a difficult dessert to make either. Layer one is baked, but has only 3 ingredients. 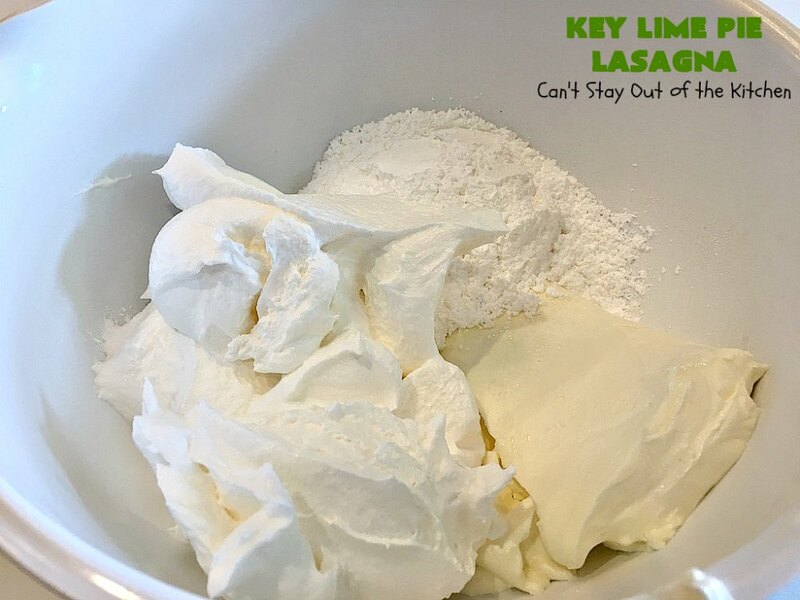 Layer 2 has only 3 ingredients. Layer 3 has one ingredient. 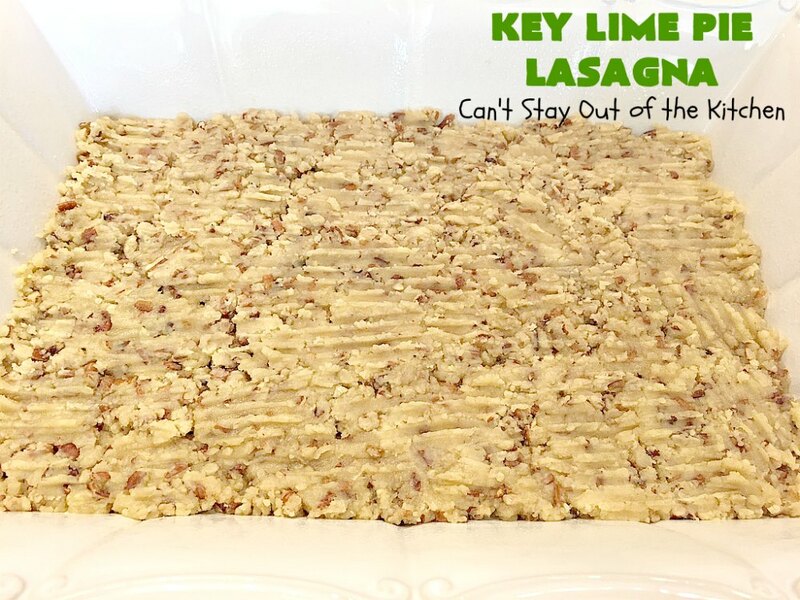 Layer 4 has 3 ingredients, but you can use only one if you want to scrap the nuts and lime zest on top. So it’s really pretty simple. Ok, now something closer to home. Have you all seen the new Magnolia Table cookbook? Well I got my copy last week and I’ve been pouring through it. It’s got some great recipes I can’t wait to try out. (I.e., Jojo’s Biscuits, Chip’s pancakes and a Lemon Pie that looked spectacular). I rarely buy cookbooks anymore because I have too many of them already. It’s also easier just to look stuff up on Pinterest and the Internet these days. But I’m glad I ordered this one. It tells their story so beautifully. John and I took our youngest son and his wife to the Silos shopping last Saturday. Wow, was it ever packed. It’s like going to Disney World! It’s a beautiful place. We were hoping to get in to Magnolia Table for lunch. We got there at 12:30. We expected to have to wait an hour or so. Unfortunately, they had stopped adding people to their waiting list at 11:00 a.m. for 3:00 p.m. closing! Note to self: NEVER visit Magnolia properties on a weekend. Go on a week day! 🙂 Even still we had fun walking around the shops and drooling over all the food from their catering trucks outside. I had one each of Joanna’s cookies: a sugar cookie and a chocolate chip cookie with peanuts and pecans. Both were awesome. Where was I? Oh, yeah, back to dessert. You can refrigerate the dessert or freeze it until about an hour before you’re ready to serve it. 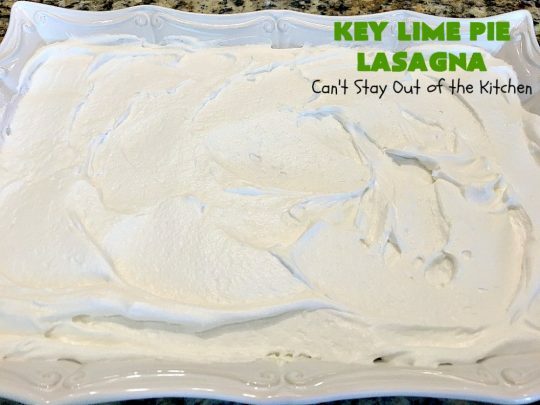 Seriously, if you want a “knock-your-socks-off” dessert, give Key Lime Pie Lasagna a try. I guarantee your family and friends will be raving over it too. Key Lime Pie Lasagna is a fabulous dessert. 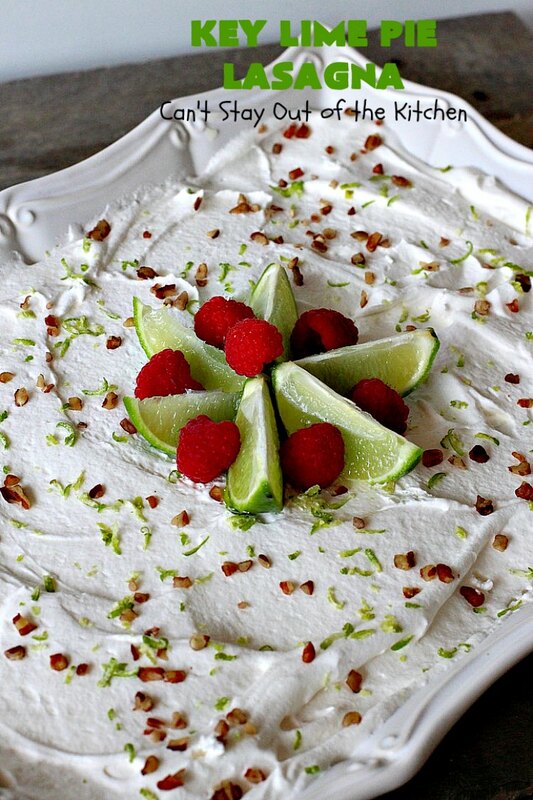 This is the perfect dessert for Mother’s Day or Father’s Day. 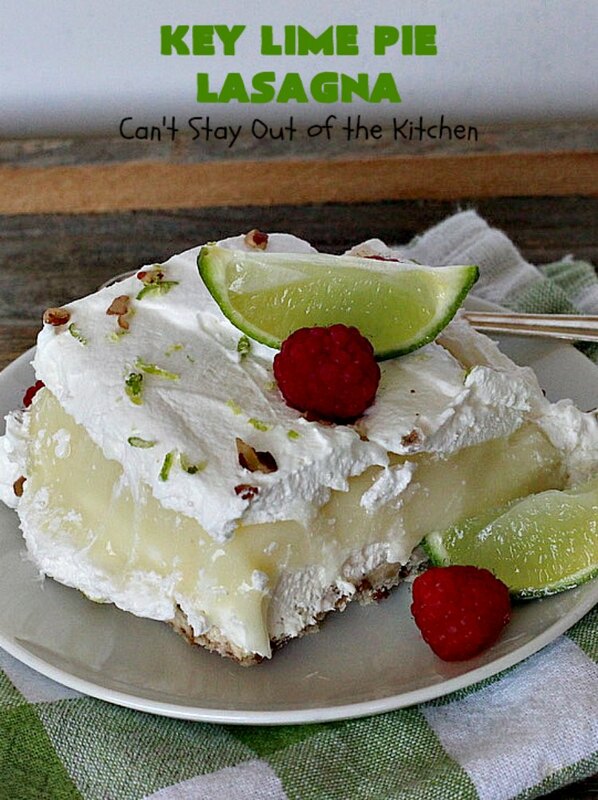 Especially if you enjoy Key Lime Pie. Key Lime Pie Lasagna is a four-layer dessert that’s absolutely mouthwatering and spectacular. If you want an extraordinary dessert for company or holidays, this dessert will knock your socks off! I used these ingredients for the crust layer (Layer one). Melt butter. Add flour and nuts. (I used pecans). Stir to combine. 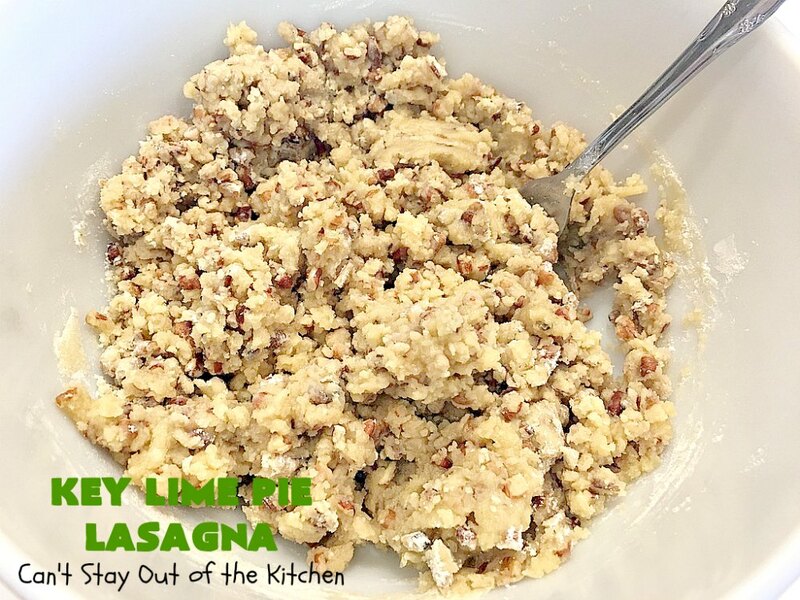 Press into a greased 9×13″ glass baking dish with a fork. Bake at 300 degrees about 10 minutes or until slightly browned and done. Allow crust layer to cool completely before adding the next layer. I used these ingredients for the cheesecake layer (Layer two). Place softened cream cheese in a mixing bowl. Add powdered sugar and whipped topping. Spread cheesecake layer (layer two) over top of crust layer (layer one). 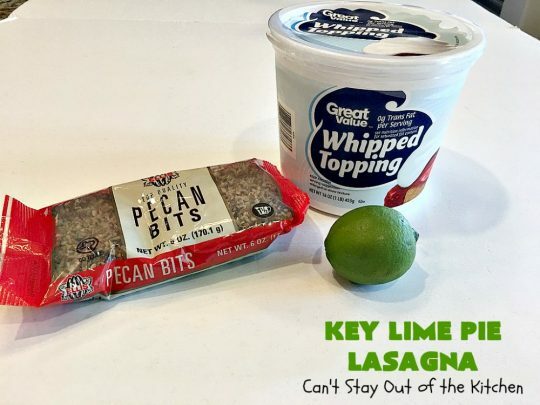 I used these ingredients for the Key Lime Pie Filling layer (Layer three). Spread Key Lime Pie Filling layer (layer three) over top of the cheesecake layer (layer two). 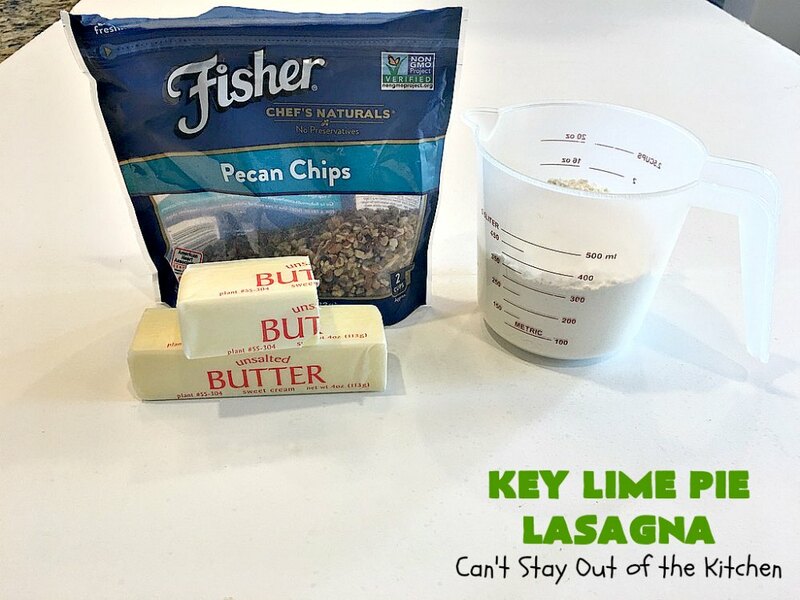 I used these ingredients for the topping layer (layer four). 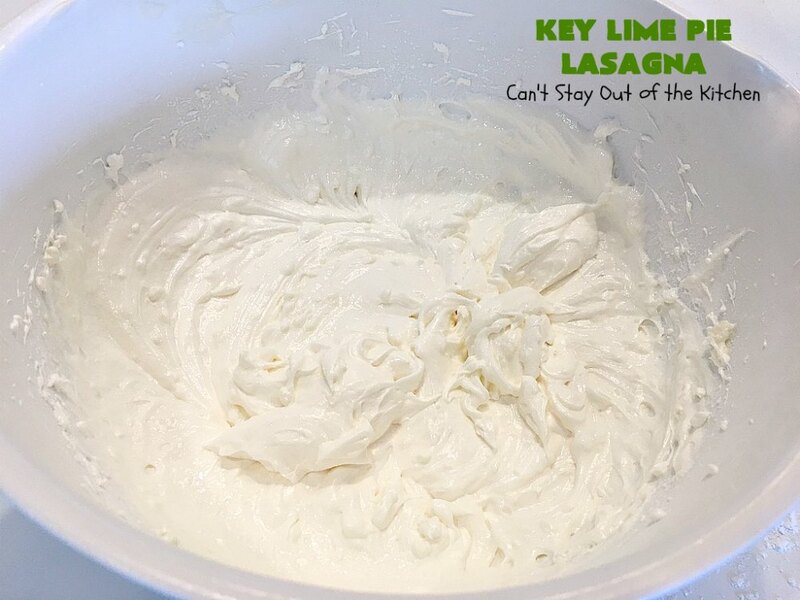 Spread whipped topping (layer four) over top of the Key Lime Pie Filling layer (layer three). 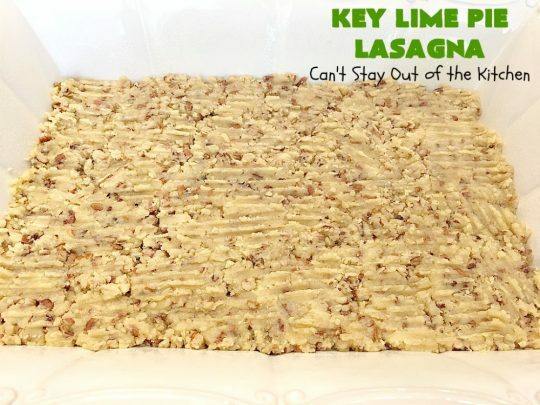 Sprinkle with grated lime zest and finely diced pecans to complete topping layer (layer four). Refrigerate or freeze until ready to serve. Every bite of Key Lime Pie Lasagna will have you oooohnhhhing and aaaahhhhing too! 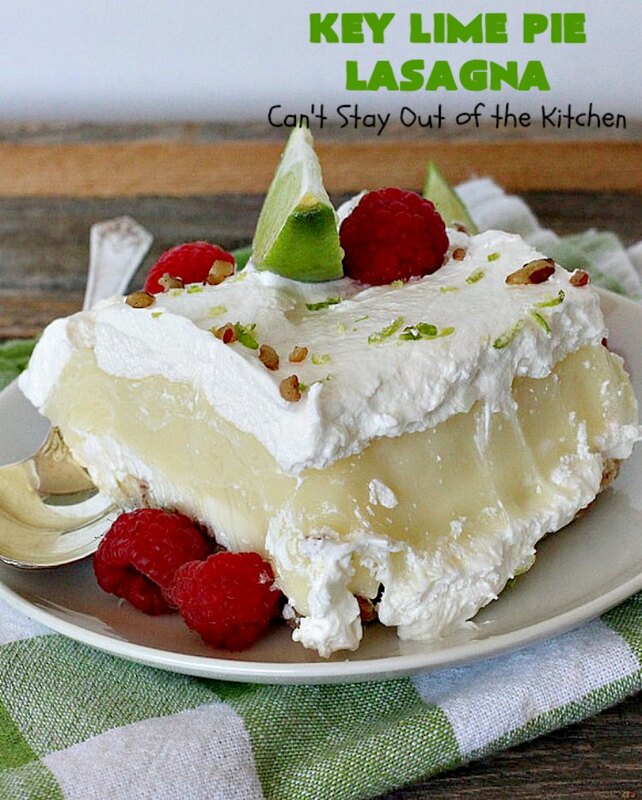 The light and creamy texture of this dessert makes for one pleasurable culinary experience! 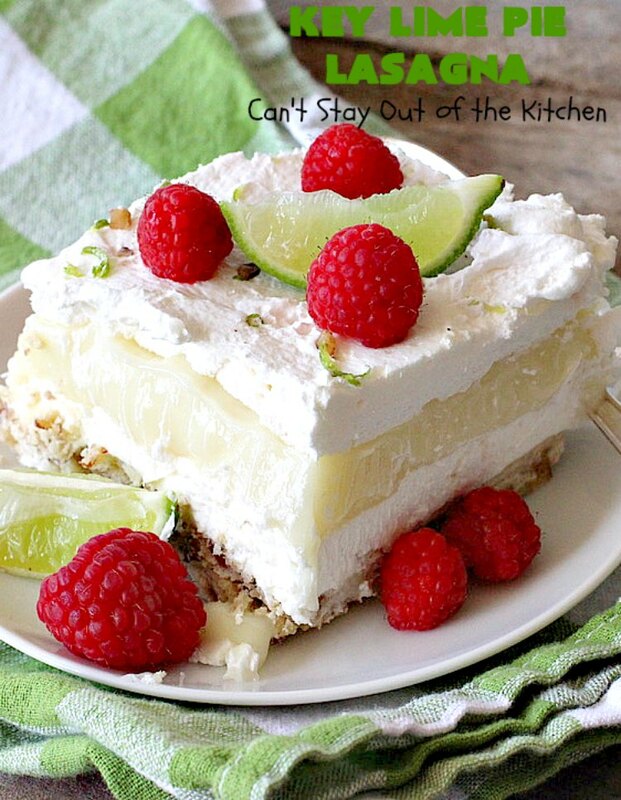 This amazing dessert has four layers of incredible deliciousness! The first layer is a nutty crust layer. The second layer is a cheesecake layer. The third layer is a Key Lie Pie filling layer. Then the top layer includes non-dairy whipped topping, nuts and lime zest. It's the perfect dessert for holidays like Mother's Day or Father's Day. Combine ingredients and press into a greased 9x13” glass baking dish. Cool completely before adding next layer. 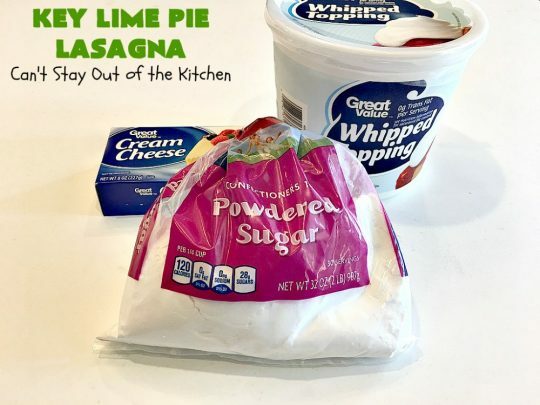 Combine ingredients with an electric mixer until smooth. Spread over top of cooled crust layer. 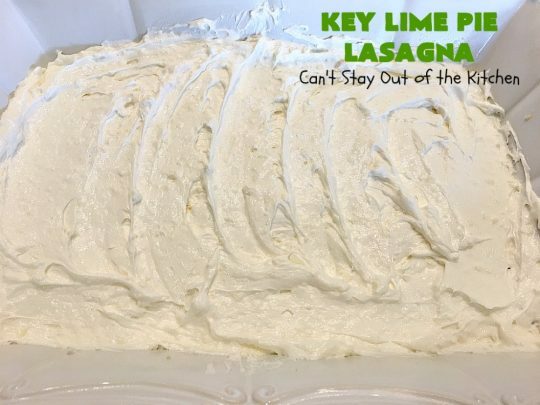 Spoon key lime pie filling evenly over top of cream cheese layer. Spread whipped topping over top of key lime pie filling layer. Sprinkle with pecans and grated lime zest. NOTE: You must allow the crust layer to cool completely before adding the cheesecake layer. 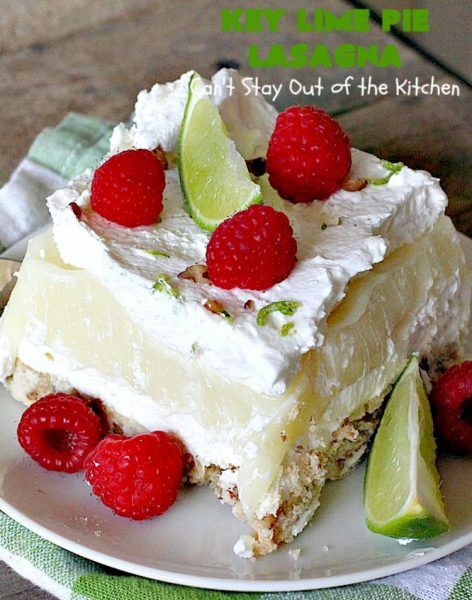 NOTE: If you freeze the dessert, set it out about an hour before serving. 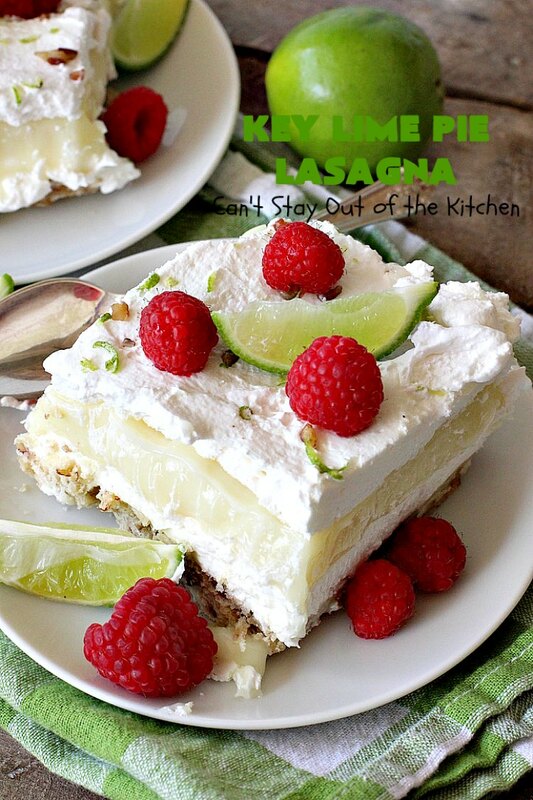 Key Lime Pie Lasagna is all you could ask for in a dessert. Plus, it’s really easy to put together. 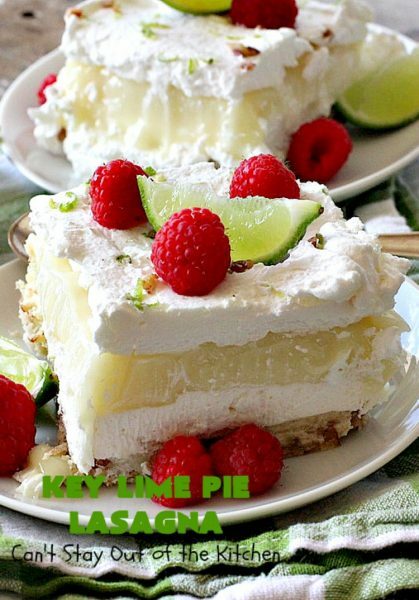 If you enjoy Key Lime Pie, you’ll love this dessert. This is one of those desserts that goes quickly. We had several come back for multiple pieces! Thanks for letting me know. We thought it was terrific too. Teresa, this would definitely be a hit at our house! 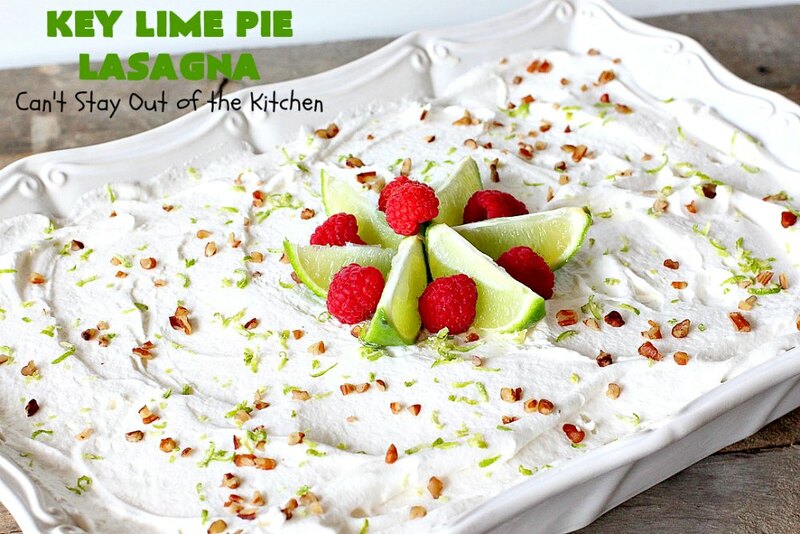 My family would definitely go ga-ga over it and it’s the perfect spring/summer dessert! Can’t wait to make it!! Thanks, Kim. We sure loved it! Hope you enjoy it.